Adorable, Sarah. What’s s/he standing on? (I can’t quite tell.) The standing point almost looks green, like moss. Very nice word depiction! Yes, it is some moss. It’s not underwater all the year around at that point, so sometimes it forms part of the pond’s bank. There are railings around the pond and lots of places for the moorhens to hide, including an island covered in undergrowth right in the middle of the pond. Hopefully, they’re safe. The seagulls visit but seem to leave the chicks alone. Love their green feet 🙂 Thank you for your poem! Thank you, Inese 🙂 I think that particular shade of green is unique. It amazes me how many different shades of green there are in nature. If one was to count them, I’m sure they’d outnumber all the variations belonging to other colours. Maybe I’m saying that because I live in a green country. If I lived in the desert, it would be all the shades of white, yellow, orange etc, without a patch of green to be seen other than in an oasis. I’ll look forward to seeing your moorhen on Saturday. And thank you, in advance, for linking it to my post. 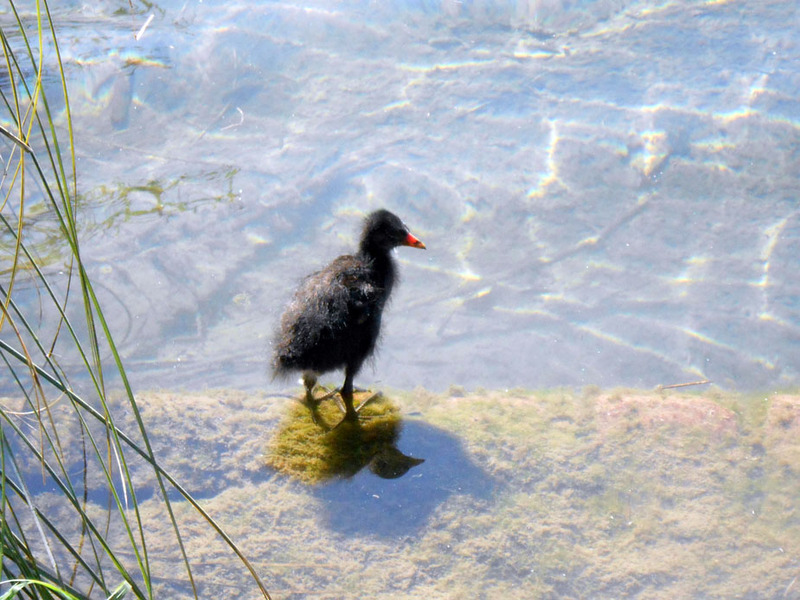 You might prefer to link to this “search” page at https://sarahpotterwrites.com/?s=moorhen as it has this haiku plus two others — one about the same chick and one about an adult moorhen. Oh thank you, I sure will link it! So cute! I love the photo and the haiku!